If you are relatively new to the sewing world, this concept may be entirely foreign. If you have been sewing since the dawn of time, you may remember the entirely cast iron machines that required constant oiling. Either way, every seamstress should know exactly when, how, why, and with what to oil their machines. A sewing machine is a big investment and just like your car, it needs regular maintenance. You wouldn't think of driving your car forever without changing the oil (well maybe some people would). Any mechanical machine with moving parts, like a sewing machine, needs to be oiled to prevent the metal parts from wearing the other metal parts down. Sewing machine oil is a lubricant that helps reduce friction between moving parts. We'll get into some of the more technical details later but just think of sewing machine oil like motor oil for your car. It keeps it running nice and smooth and helps guarantee that your investment will last for a long time. There are many different types of sewing machine available and we'll dive into more detail down below. If you want to skip to our recommendations, here are our top 4 picks for sewing machine oil. Why Should I Oil My Machine? Even though most of us do not have a full understanding of the magic that takes place within a sewing machine, I think it is safe to say we all know that there are a lot of moving parts, and that we want those parts to keep moving. Along with there being many moving parts, there are many parts that work together and rub against one another. The machines are made to operate in this way, but this constant movement will eventually cause some wear and tear. I like to think of the gears and parts in a sewing machine like a tennis player’s elbow. Our elbows are made to swing our arms back and forth. They are perfectly situated to where they rub against our lower arm and upper arm just the right amount to provide the mobility we need. However, despite our elbows being made specifically for this purpose, a tennis player is going to experience some soreness after a long practice or tournament from that constant rubbing of his or her elbow. As a result, they may apply ice, heat, or a specific product made to assist their elbow in recovering. Treat your sewing machines’ parts like a tennis player would treat his or her elbow. Oiling the parts of a sewing machine serves two main purposes. The first is similar to the reason you would oil just about anything. If your machine has metal parts, you want to prevent rusting and degradation. However, oiling the machine also serves to provide lubrication for the parts that are constantly rubbing together. How To Oil A Sewing Machine? Oiling a machine is different for every single one, so there is no blanket statement answer for this. For the most success, consult your machine’s owner’s manual. It should provide how, how often, and with what oil the manufacturer recommends. This varies even more with the more modern sewing machines than it has in the past because each one is made using different materials. The manual will tell you which specific parts require oiling and how to get to each one. For many newer machines, it may be more beneficial to look into having a local sewing machine technician perform routine maintenance. This can even be done just once per year to improve the performance and lifespan of your machine. As far as how often to oil your machine, this will vary by which machine it is, how often you use it, and what kind of projects you use it for. Many people recommend cleaning away debris and adding a little bit of oil after each project, or after eight hours of use. A rule of thumb is to oil your machine whenever you notice that it is not as smooth or quiet as normal. When the parts lose their lubrication, they do not operate as smoothly, and they make much more noise as they move. Again, consult your product’s manual for specifics. Generally, oiling a machine is a pretty simple concept. The two most important things to remember are that you must use the proper products, and that it does not require much oil. It is completely possible to over oil your machine, which can lead to build up and much bigger problems than you may have had before the oil. If you only remember one thing from this article, remember that less is more. If you're not sure how much oil to use, err on the side of using less than you think you need. Best practice is often to put the oil on your finger or a cotton swab, rather than pouring it directly into the machine. Again, consulting your owner’s manual will be the best resource for this process. What Kind of Sewing Machine Oil Do You Need? First and foremost, do not use automotive oil or cooking oil. Both of these things will cause massive problems within your machine. Additionally, do not use WD-40, which is specifically used to clean and remove rust, without providing the lubrication your machine needs. If any oil you come in contact with has a smell, a color, or any sort of thickness to it, do not put this into your machine. These oils are made for other purposes and will do nothing but damage to your machine. Again, consulting your owner’s manual first is highly recommended. This is especially true if your machine is under warranty. In some sewing machine warranties, the manufacturer will require the use of a specific oil in order for your machine to stay under warranty. However, if your machine is not under warranty, I recommend looking around because there are likely other oils that perform as well as or even better than the manufacturer’s recommendation. The next option after consulting your owner’s manual is to consult a sewing machine technician. At a sewing machine store, the employees should be able to recommend exactly the product you need for your machine. At larger stores not focused on sewing machines, the employees may know what is in stock or what is on sale, but it is very unlikely that they know the proper oil for your sewing machine. Picking the proper product will take a little bit of time and research and may cost slightly more than the lower-quality products, but trust me when I say, you are ultimately saving so much money, time, and frustration. Do I Need A Specific Type of Sewing Machine Oil? One area that causes a lot of confusion is on specific brands of sewing machine oil. Many people assume that if they have a Singer sewing machine, then they need singer sewing machine oil. Or a Brother sewing machine requires Brother sewing machine oil. It's probably good marketing by these companies to convince you to buy their specific oil, but the truth is most sewing machines work the same way and so does the oil. As long as you are buying sewing machine oil, it will work on almost any sewing machine. The only exception to this is that there are different types of sewing machine oil that are specifically formulated for industrial sewing machines. If you have a heavy duty sewing machine or an industrial sewing machine, you should purchase industrial oil which is made specifically for those types of machines. What Is Viscosity and What Do I Need To Look For? One of the ways people describe oil is by its viscosity. Viscosity sounds complex but it just means how thick the oil is. An example of something with a very low viscosity is water. When you pour it out it runs quick and spreads everywhere. An example of high viscosity is syrup. When you pour it out it flows slowly and feels very thick. You usually don't need to worry about choosing a specific viscosity for your sewing machine oil. The manufacturer of your machine will either recommend a specific type to use or you can just use the Singer Sewing Machine Oil which we chose as our top pick. It's super affordable and works well on all sewing machines, not just Singer's own. What Is The Best Sewing Machine Oil? Even though the needs of each sewing machine varies greatly, there are some products that are a fairly safe bet for most sewing machine needs. 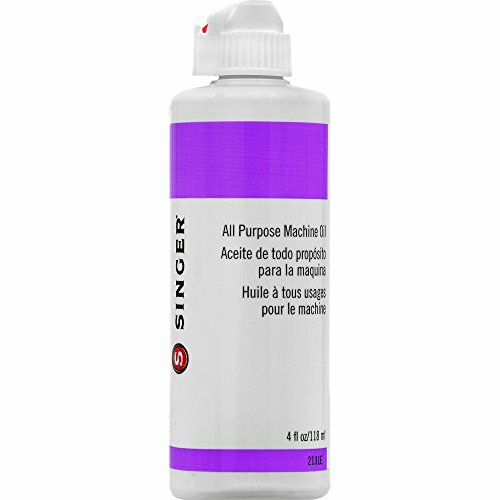 If I were to recommend one specific product, it would be Singer Machine Oil.. The formulation is the same that Singer has used for decades and is specifically for sewing and knitting machines. However, one of the more impressive features of this product is that it can be used for pretty much any small machine you may have. From vacuum cleaners, to computers, to other household appliances, this oil can be used to lubricate and reduce aging within just about any machine. There are complaints about the length and convenience of the nozzle that is used to apply it to different parts, but many people were able to make do anyway. Overall, this product is made by a well-trusted sewing machine brand, does not cost much at all, and has all of the necessary components of sewing machine oil. Below, I have provided a quick pro-con list, along with a link to the Amazon listing for the product. If you take one thing away from this, I would hope it is that oiling your machine is extremely important for its productivity and longevity. Also, avoid the big box stores and brands along with the countless alternatives to oiling. Invest a little bit of money and a tiny amount of time into caring for your sewing machine, and it will continue to power through project after project for years to come.